“What contribution do you hope to make to our optometry program and to the optometric profession?” is a question you will most likely to be asked during the application process. How do you answer a question like this? More importantly, why do admissions officers ask this question? What are they trying to find out? On SCCO’s supplemental application, the question is asked like this: “What is the most important contribution you hope to make to the SCCO family?” Customarily, answers to this question forecast what you hope to contribute as an optometry student with your time and talents: through student leadership, academic achievement, and student body camaraderie. You will answer the question about what you hope to contribute based on your track record, your history as a student. But, I want you to dig deeper… Just what DO you have to offer as a student to an optometry program? What are your strengths? What will you bring to the table? To provide a comprehensive answer with tangible examples for this question, I recommend you start by assessing your personality profile, which can be done by using an assessment respected by educators, the Myers-Briggs Type Indicator (MBTI). ENFJs are people-focused individuals. They live in the world of people possibilities. More so than any other type, they have excellent people skills. They understand and care about people, and have a special talent for bringing out the best in others. ENFJ’s main interest in life is giving love, support, and a good time to other people. They are focused on understanding, supporting, and encouraging others. They make things happen for people, and get their best personal satisfaction from this. Let’s say I was applying for a job as a counselor and speaker who would be hired to work with pre-optometry students. Imagine what a terrific asset this intrinsic part of my personality would be on an employment application?! It’s tangible evidence of how I function, how I am hardwired. This is what I want you to learn about yourself by understanding your own profile and then, to discuss in your personal essays and interview. It will give you real, tangible evidence of many qualities you possess but I can guarantee, have not thought of as uniquely yours. Examples might be: rational thinker, problem solver, compassionate, good at strategic planning, a people-person, able to persevere—the list goes on and on. Click here for an infographic about MBTI profiles and how they migh correspond to various professions. I love the study of human typology and have benefited from it in many ways, not only how I understand myself and my own behavior, but how I perceive others. It’s only when you understand your own personality can you then understand the inherent bias in your perception of yourself and your decision-making processes. Once you understand your own unique temperament, you begin to be aware of how you impact others. You learn to speculate about another’s personality type and adapt your communication style to relate better to your intended audience. Not only will you use this information in your personal essays to answer the question about what you will bring to the table, but it will help in the interview when asked this same question. You will speak with intention about your inherent skills and how you expect to apply them as an optometry student and as a doctor delivering patient care. If you take the test, I’d love it if you made a comment and put your MBTI profile in the comment section—unless you would indulge me with a little about anything new you may have learned about yourself. I’d REALLY love to hear from you! Even Harry Potter uses the MTBI! 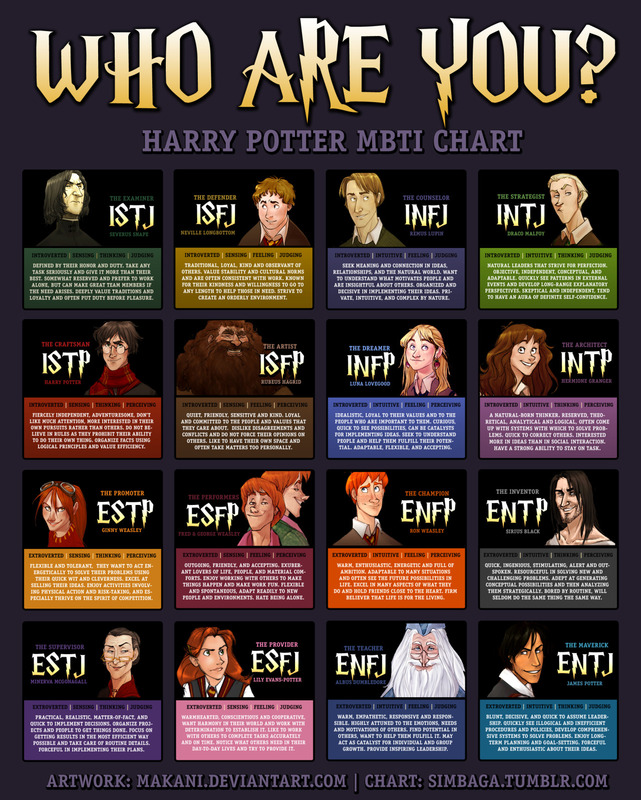 Click here for a infographic with the MTBI temperaments of the Harry Potter characters. *Disclaimer: this is not an official test. To be official, the test must be administered by a person certified to administer the test. It’s another example of how the MBTI is recognized in the work place. Here’s an article in Time Magazine that makes predictions about earning potential based on one’s MBTI profile. As you interpret the data, remember that the Bill Gates and Steve Jobs of the world are the NTs: the thinkers, strategizers and visionaries. Tagged as: bring to the table, getting into optometry school, Interview, mbku, myers briggs, optometry admissions, optometry school admissions, personal statements, personality test, scco. I couldn’t agree more about the benefits of using the Myers’s Briggs test. I actually did this exercise as part of a year long “career exploration” process, where I worked with a career counselor from the Rockport institute. This is how I landed on optometry! Have you heard of the books “The Pathfinder” and “Do What You Are”? Based on your blog posts, I think you would really like them. They could be helpful to the students you speak with who are still solidifying their career decisions. My personality type is INFJ. I love working 1-on-1, in a structured environment, understanding how complex systems work, helping people solve problems, while listening & explaining with care and compassion. I’ve come to believe that 1) “N” optometrists will contribute to developing new and innovative ways of delivering eye care, as the scope of practice for optometrists increases and as technology advances and 2) NF’s have a knack for provided counsel, support, and clear explanation to patients and 3) “N” optometrists are inherently interested in understanding the complexity and inter-relatedness of the ocular system. You clearly use your ENFJ superpowers (among others) to provide students incredibly helpful information and encouragement regarding entering the field of optometry. Your blog posts and videos have been a wonderful resource! Thank you, sincerely. So excited to meet you all this Saturday! Thank you Zach for this thoughtful reply. I love to receive comments to my articles. First of all, I will check out your book recommendations. I typically don’t counsel those choosing careers other than optometry, so helping a student choose another career path is not my purview. I unfortunately do have to counsel some for whom optometry, for a variety of reasons, is out of their reach. That is always sad for me because I DO SO LOVE this profession! I will look forward Saturday to meeting a fellow “NF.” The “N” temperament is only 25% of the population, so we are by definition the exception rather than the rule. I love my “N,” but sometimes have to dial it back for the “SJs” I encounter for fear that they think I’m a weirdo. Perhaps you have had the same experience. But let me tell you something, once you bond with your patients, they will especially love the “NF” in you, their care provider. Yes, your INFJ profile is perfect for teaching/counseling. Tailormade! One needs to get a science education to become an optometrist, but I assure you, the daily operations of the optometrist is one of teaching and counseling. NFs are true champions of the human cause, and as such, we love people and everything that makes them human–the good, bad and the ugly. Thank you for the exceptionally kind words of praise. It is my GREATEST joy to help future optometrists ramp up for a wonderful experience in, first the application process, optometry school, and then on to the joy inherent in being a doctor to a patient, which is the noblest and most sacred calling of all. Thank you again. I too am looking forward to meeting you tomorrow. You’re in for a great time. It’s all ahead of you! I actually took the MBTI test two years back, and during that time I was unconfident in deciding my future career goal. All my life I thought of going into a health-related career path, but my grades were lacking. With this quiz, I found that I am an ESFJ, “The Consul,” and saw that my qualities could fit well with health professions so I didn’t give up and kept working towards my goal. When you brought up the quiz at the SCCO Open House this year, I was pleasantly reminded of why I was sitting in the audience that day. Working in an optometry office and seeing what optometrists do show that I can bring a lot to the table as an ESFJ, creating relationships with patients with my social and personable personality, providing support and service to them. I now find it uncanny that I expressed these traits in my personal statement and list of experiences. Dr. Fleenor of “The Medical School Interview” book advised interviewers to create a list of attributes that stem from past experiences, so they could be exemplified to the interviewer of any medical/optometry school. After stumbling upon this thread again I was reminded to go back to the quiz; it’s always hard for me to compliment myself, so seeing who I am on paper gives me confidence in knowing exactly who I am as I prepare for my interview in a few weeks. Thank you so much for all your hard work in your blogs. I have read through many of them (and still am) and found so much help when applying to SCCO. I love how transparent SCCO admissions is with the application process, making it a less stressful experience for applicants. The amazing faculty is one of the reasons why I applied here! Thanks again and I look forward to seeing you and Eryn soon. Thank you for your considerate reply Nina! I’m so glad you were able to use your MBTI results in a way that helps portray personal qualities that will help articulate why optometry is right for you. I am so pleased to hear that you have availed yourself of Dr. Fleenor’s book, my favorite resource to recommend to applicants who are preparing for the interview process. Couple this with your MBTI results, as you have already done, and you have tangible ways describe inherent qualities that will make you a great health care provider, and specifically a doctor of optometry. Thank you so much for the kind words. It is indeed a privilege to help applicants take their places within the profession. You will not regret one moment of the hard work you are putting into this goal, and I speak from experience because with all my years now as an optometrist–40 to be exact–I would have chosen nothing else. What a pleasant surprise to see so many different personalities within this ongoing blog post! It was definitely fun to read many people’s analysis of their perceived typology. I would like to contribute to this community as another fellow ENFJ! I was fortunate enough to dodge a writer’s block when writing my personal statement. But your enthusiastic advice for applicants to take the test left me curious to see how knowing my personality could drive my ambitions. What I can say is that I am pleasantly surprised to learn how much my personality type aligns with my aspirations of becoming a more contributing individual! One of the most striking description in the ENFJ profile explained that The Giver “lives in the world of people possibilities.” Maybe it’s the only child in me that seeks to create connections with the people around me, but this quote explains why I value and maintain friendships with people of unique personalities. Understanding a wide range of different personalities has always been my forte when creating connections with my peers, family, and mentors! Another takeaway from the profile was an ENFJ’s importance to spend some time alone. Without a doubt, I am receptive to the energy that surrounds me and easily feed off of it, but I agree that time alone is just as necessary to refocus and reflect on my values! Thank you for sharing this post during this year’s summer workshop! I love the motivation and positivity this thread has brought to many pre-optometrists. It is mentors like you and Mrs. Kraning who are able to transfer wisdom in such a personable way. Your testimony about the MBTI test has once again affirmed my position of recommending it for applicants. Indeed, we have the hardest time understanding ourselves. It takes objectivity and a context to understand oneself, and that’s what this MBTI profile test provides. I hope you go on to be an ardent student of who you are relative to your world and its influences. It will be time well spent–for you and your future patients. Another resource I recommend highly is Eckhart Tolle’s, “The Power of Now.” I reread it regularly, and it never fails to amaze me with its insights and applications to everyday life. It’s for the sophisticated seeker, of which I categorize anyone who takes my advice to take the MBTI. It’s especially for the “NFs” of the MBTI (a shortcut notation for the intuitive feelers, which given your MBTI results, you are). Thank you for taking the time to reply and especially, thank you for your kind words. It means more than you know. As I sit here trying to add more depth to my personal statement I came across this post. Whether it was by chance or luck, or perhaps a little bit of both, it has definitely helped guide the direction of my personal statement, so thank you for that!! My results for the MBTI test indicated that I am a fellow ENFJ, and at first I was a little worried when I read the trademark of an ENFJ, “The first shall be last.” But after delving deeper into the true nature of an ENFJ, I realized it’s not that we don’t give people our undivided attention, we in fact give too much attention to everyone else but ourselves. As an NF, I know there have many times where I have neglected myself and taken on the burdens of others, but it is so hard for me to say no, and that is something I’ve tried to improve over the years. It was very interesting to see the results of the MBTI, as I remembered I had recently taken another human typology test called the Strength Finders. This test indicates your 5 most dominant themes of talent that you exemplify. My top 5 themes were: responsibility, restorative, learner, developer, and intellection. With responsibility being my first theme it “forces you to take psychological ownership for anything you commit to, and whether large or small, you feel emotionally bound to follow it through to completion…If for some reason you cannot deliver, you automatically start to look for ways to make it up to the other person…Your willingness to volunteer may sometimes lead you to take on more than you should.” It was intriguing to see how well this correlated to the trademark of an ENFJ and it made me realize how quickly I concluded this was a negative about myself, but in fact it was shown as a strength and a positive. Thank you for providing us with this article and the opportunity to take the MBTI. I truly appreciate all the effort and time you put into these blog posts, and SCCO’s facebook group. All of it has helped guide me and made my application process to Optometry school a lot smoother. A fellow ENFJ! I think us NFs are the ones who appreciate the MBTI wisdom the most. As you have discovered, there are various human typology tests. I have found wisdom inherent in all of them. I am SO HAPPY that you were able to mine the “gold” you have inside yourself when it comes to appreciating your inherent character strengths. Also, I hear in your narrative that you recognized some of your possible biases, which I find is an equally important aspect to learning about yourself through this typology profiling. Thank you for writing such a comprehensive reply. It is my privilege to help applicants like you. The test shows that I am an ESFP. In my opinion this is spot on.”ESFPs love people, excitement, and fun. ESFPs learn easily and quickly when the new material is delivered in a concrete, visual way.” This is exactly how I am. At work, the more I am able to “do” with my hands, the faster I am able to learn. I love interacting with people and the thrill I get from being spontaneous. I also love making people laugh and smile just from my upbeat attitude. Thank you so much for writing this post! Sorry for digging it out of the archives, but it has been a huge help for my personal statement. I had the worst writer’s block until I read this article. I was stumped upon how to add more depth to “what sets me apart from other applicants” and this has helped me greatly! Thank you for taking the time to write Matthew! I love to hear that it helped with your writer’s block. It is indeed hard to be objective about ourselves when taking inventory of our attributes. I know you’ve gained insight! Again, thanks for the reply. I’m not sure if it was by chance or luck, or perhaps a little bit of both that I came across this post today. I was having a hard time answering “What is the most important contribution you hope to make to the SCCO family?” This afternoon I was on your blog looking for something else when I came across this post. Of course I had to take the MBTI test right away, truth be told I took it twice, and both times confirmed that I am an ISFJ! At first I was a little concerned. I was thinking, “How is being an introvert going to help me contribute to the SCCO family or become a great optometrist?” As I read through the description I realized there were many qualities of an ISFJ that I resonated with and they were in fact great qualities to go into the optometry field with. Although I am an introvert, I am very much so a people-person. I like being around people and helping them in any way that I can. I am very aware of my feelings and those of others’, which why I prefer to interact with people in one-on-one situations. I like to give people my undivided attention and sympathize with them fully, which is a great quality for an optometrist to have. I am very excited to finish my application now! Thank you for another great post! You have been a tremendous help to me in this whole process! I’m so happy that you took the time to take the test. There is such misunderstanding around what introversion versus extroversion. Many confuse introversion with shyness, and that is NOT the case. Shyness, in its spectrum, can describe someone who is uncomfortable around other people all the way to neurosis where they experience anxiety in various social situations. That is not what introversion is. Introversion has to do with the way one processes information. Extroverts process information by “speaking it,” and bouncing it off of others. They process thoughts and feelings externally. If you ask an extrovert to sit and ponder something, it would be torture. Introverts are just the opposite. When confronted with a decision or situation requiring thought, introverts will want to withdraw and process information alone. Introverts need to contemplate and decide for themselves how they feel/think about a situation before they discuss it with others. They need alone-time for processing and can be caught off guard when situations present that require quick thinking. Being an introvert has little to do with either liking people or even seeking their company. For example, I am the consummate extrovert. Often times, when something comes out of my mouth, it’s the first time my brain actually put it all together. I say to myself, “Jeepers, did that thought just come from me?” Yep, sounds strange, but that’s the way we’re wired. I try to copy my introverted friends when it comes time to truly think through a situation before I seek outside input. I’m not that good at it but I try! It was my pleasure to meet you. Keep up the good work! First and foremost, I just wanted to say thank you for being so approachable via e-mail for the past few years, and getting back to me so quickly! The Pre-Opt road is a stressful one (I’m sure you know, as you have experienced it yourself), and having someone answer ALL my questions as soon as possible definitely makes the journey a lot less stressful! I have been working on my personal statement for weeks now, and took the MBTI test and was shocked to see how much my personal statement relates to my personality type (ha!). I have taken this test a few years ago, as I was a Psychology major for awhile, but I totally forgot the details of my personality type! I am a fellow ENFJ as well. I love helping others and being there for people, no matter what the circumstance. I am also a very bubbly and fun person to be around and always directing my energy into the outside world. I believe self reflection can be difficult at times, especially when you have to really dig deep and figure out how to want to express yourself in your personal statement or supplemental applications- it takes time and can be a tiring process! So thank you including the MBTI in our supplemental applications, it definitely helped me! Thank you for the kind words of praise Hedi. We are here to help and yes, I know first hand what is involved in the admissions process from the applicant’s perspective. Given their love or people, ENFJs are inherently intrigued with various human typology tools. Myers-Briggs happens to be my favorite and is respected in the psychologic community. Your reaction about being shocked at how well it nailed your personality is a common one. A fellow ENJF! You have many intrinsic personal qualities that will make you a great health care provider and especially a doctor. Feel free to write about those qualities and even specifically that you took the MBTI profile test to learn and thus articulate what they are. Thanks for taking the time to both take the test and comment. I’m currently in the process of drafting my personal statement and remembered back to what you had spoken about at SCOO’s admissions workshop this summer. I immediately looked up the MBTI test for inspiration and found out that I am a fellow ENFJ! In reading the profile link for an ENFJ a few quotes stood out to me. “ENFJs live in a world of people possibilities. They make things happen for people, and get their personal satisfaction from this.” I think that this is an inherent quality in myself, but is something that has definitely grown over time! I began working at a private optometry practice two years ago as an optician, and I remember back to how introverted I was in my first month working to how I am today after meeting and interacting with so many different patients and coworkers. I love the fact that I get to meet new people everyday, because everyone has a unique story that is worth listening to. I feel that experience does have a large impact on you, and that your personality is always open to growth and change! My experience has definitely shaped me as a person and shown me the depth of what a career in the health care field has to offer,especially optometry! “The Giver” title of ENFJs is close to home with me as I prioritize making sure that everyone around me is happy and well, and am the happiest when they are. I think this speaks of a good health care provider as their upmost priority is providing the best care for their patients and ensuring their satisfaction. This article and the personality test revealed to me some traits I didn’t know I had and re-affirmed the traits I felt would help me along my journey to becoming an optometrist. Thank you for this post, and for all your advice at the workshop! You and Eryn are both so helpful and constantly show how much you care about us applicants; the blog posts and youtube videos help so much with application stress!! Thank you Paris for your detailed message. I am SO happy that you found the exercise useful. Yes, your personality is and SHOULD be always open to growth and change. I’ve said this often: one should be able to apply whatever MBTI trait that the situation calls for. I am convinced that our basic hardwiring never changes but we do learn how to “call ourselves out” when it comes time to depart from our natural hardwiring for situations that call for just that. It’s so nice to meet a fellow ENJF! I just got a dog and have been watching Cesar Millan’s Dog Whisperer TV show. I am convinced he too is an ENFJ just like Oprah Winfrey, you and me. Fascinating. I’m sure now that you’ve become familiar with the typology, you’ll start recognizing yourself in others. What a coincidence that I came across this article this summer! A few months ago I took a keen interest in Myers-Briggs personalities. I am an INFJ. I had taken the test a few years ago and read some short summaries about my personality, which all sounded very accurate to me. But what interested me most this past summer was reading about other people’s personalities. I asked close friends what their MBTIs were and started researching online. At first it just seemed almost eerie how accurate the descriptions were, but it really opened up my eyes. Although my personality has always made me lean towards compassion and empathy, I have always had a hard time understanding why other people work a certain way. Why isn’t everyone more compassionate and empathetic if these are such great traits to have? Questions like that were always on my mind. I believe learning about other people’s personalities especially those we interact with is just as useful as knowing about our own personalities. It has helped me become more empathetic and understanding of others because I no longer question their actions just because they differ from my own. Although I know a lot of people who have taken the Myers-Briggs test, many of us seem to take it simply out of curiosity. I’m glad to know that you believe MBTIs can serve as evidence for one’s personality and values. Thank you so much for this article! And all the others on SCCO’s site. It will definitely help me as I write my personal statement and answer supplemental questions for optometry school applications! Thank you Emily for your comments. I am so pleased you found the MBTI test to be a useful tool. I can tell you are a “F” (feeler) because of the references you make to compassion and empathy. This most certainly is your epistemology when it comes to perceiving others. BTW, your profile is perfect for being a counselor and teacher–both professions requiring empathy and compassion. You’ve touched on the brilliance of the MBTI test and that is to both communicate and respond effectively, one must know his or her audience! MBTI’s basic premise is that a person is hardwired with a natural “bent” for perceiving the world around him or her. When I say bent, I mean an inherently biased perception. Understanding that each and every one of us has this bias is key to being more understanding of others. Most people just assume everyone’s human brain has the same operating system and as such, forget about inherent biases in perception, communication, and actions. It is the student of Myers-Briggs who can better navigate these differences. As a health care provider, you will do well to understand your patients in this light. I love hearing from you Emily! Thank you for taking the time to write. My results revealed me as an INFJ. I am sort of at a loss for words for how perfectly relatable the profile of the “INFJ” is, not to mention humbling. Honestly speaking, I always feared the faults of being the sensitive person that I am. I make an intuitive connection with those around me, which can also mean that I willingly carry their emotional burdens with me as well. Whether they like it or not, when they hurt, I really, really hurt with them. Admittedly, it can be a heavy toll, but the Myers-Briggs results have eloquently emphasized the virtue in such empathy. Coupled with a drive for high expectations, I am SO hopeful that this concern for others serves me well as a doctor. There is yet another strong point brought forth by my results: “On the other hand, INFJ is a perfectionist who doubts that they are living up to their full potential”. Somehow, as I am sharing my results in this discussion feed alongside my pre-optometry peers/colleagues, this INFJ feels at peace. The decription of the INFJ profile is absolutely true– complete peace is extremely hard to attain for us. But I feel, and I so hope that all of the others currently applying also feel, in my element. How wonderful it is to be included in such a community– thank you infinitely, Dr. Munroe and Eryn, for pioneering it. The worth of taking this Myers-Briggs test is immeasurable. Thank you Rachel for the time you took to respond and especially for your candor. You make a great point about complete peace being a struggle for an NF (and the shorthand for your profile is an NF, an intuitive feeler). NF–as I know all too well–crave integration between their spiritual, emotional and physical lives. Not so with other types, especially the SP (the sensate perceiver) who takes the world and life’s situations as they come, pretty much resolved to any outcome. The comment, “Whatever,” applies to how the SP feels about life’s ups and downs. Not so for us NFs (especially the ones with a strong J). We seek harmony, we want situations resolved, we long for peace, we need for our relationships to be reconciled and since this is a rare occurrence, we suffer and often take this unreconciliation personally. NFs are prone to depression for this reason. We take life too seriously and feel too deeply. Now that you know this about yourself, you can call yourself out! I have to do it all the time. Ask my close friends, because I mean I counsel myself ALL the time. INFJ is the perfect profile for a counselor and whether you can see this now or not, that is what a doctor is from a patient’s standpoint. Often times, patients struggle with health concerns that cannot be resolved. The only choice they have is to soldier on and it really helps to have a doctor who understands the severity of their situation–sometimes the gravity of their situation–and be the encourager as well as health care provider. You will be a wonderful doctor because you identify with people. Thank you again for taking the time to comment. I’m so glad you learned something more about yourself. I got typed as INFJ. Well, high school I dismissed all the potential career choices suggested by the personality test, because I tested positive for INFJ. I recount seeing artist, counselor, clergy, medical doctor, and teacher as potential fields. I did not see myself as any one of them. Most artists live off a minimal diet, and I like food. Counseling isn’t for my taste because I already have enough personal problems, let along wanting to hear more problems from other people. Life as a clergy is troublesome, wherever people congregate, there are issues. I’d end up needing counsel myself, so no, thank you. Medicine requires a passion for the human anatomy. I didn’t have one. Finally, as a teacher, an eternal damnation in a class room, so that’s not going to happen. There was a mistake with the personality program, I reckoned. That was over ten years ago, and I must say, this test has merit. I can now relate to the INFJ type description. To my astonishment, all of the career suggestions that I disagreed with above, do benefit from personality traits that I am seeing more of, in myself, as my journey continues. Perhaps, being out of the incubator (high school) encouraged all those traits to surface. It is true, that I am a “’doer’ as well as dreamer.” As it stands now, I am working to make several dreams closer to reality. This test is helpful to me in presenting meaningful explanations to my behaviors and habits. I’m not sure if I was ever mistaken for an “extrovert,” but my genuine interest in people does make it convenient for me to connect with others. Allow me to share one example. I can recount some instances at a former employment, when colleagues articulated their emotions to me. Here I was, some twenty some year old person, had somehow earned their trust, listening (more) and conversing about private matters that generally exists only in private journals. Now wait a minute. It just dawned on me. That my workbench experienced a momentary substitution as an open confessional, how brilliant! Thank you for posting this entry, Dr. Munroe, and Eryn for sharing. This is giving me ideas to think about, so, off to dreaming, like a giraffe with its head in the cloud. Love your self-effacing humor Eric! I can tell by the way you write that you are a “NF” because your writing is filled with feeling and insight. NFs are constantly reconciling themselves relative to the world, trying to find where they fit in. NFs need integration of their mind, body and spirit. SPs are just the opposite. They can be OK with the various situations they find themselves in with no need to make sense out of it. They take life as it is. Not so for us NFs! To be a doctor is to be a teacher and counselor. Yes, you do your doctor thinking to make a diagnosis, but then, you have to communicate with the patient, show compassion, and sometimes even be there for them as they go through difficult times with vision problems or ocular disease. Day to day operations for optometrists are to function as teacher/counselor–especially if you own your own business where you have to manage employees too. It’s not your “I” (introversion) that gives you your interest in people. It’s the “NF” part, the intuitive-feeler part. Extroverts aren’t necessarily people persons. Extroversion versus introversion is an indication of how one processes information, whether they do it internally and alone versus externally, where they may bounce it off someone else. People misunderstand these two terms. Sounds to me like you “matured” into your natural innate hardwiring! Good for you! You have finally realized the nature of the operating system you have on board. Thank you for the kind words of praise! Thank you for commenting and especially for taking the time to do the MBTI test! I had taken the MBTI about 2 years ago when I worked as a Peer Adviser at the Career Center at my school. The main reason I had taken it was because the career counselors explained how important it is to understand personality types because it can help students that are unsure about their major/career choices. From what I remember, I was an ESTJ, so it’s pretty interesting to see my results have changed slightly but still very similar. After taking the MBTI again, I received ESFJ. I definitely enjoyed reading the description and analysis of ESFJ. I actually read my results to my mom after and she laughed because she said it was spot on! I appreciate the tips and advice provided on this blog! I always find it difficult to write about myself, so I have been having trouble forming my personal statement. However, after reading about ESFJs and focusing on my values and myself in general, I think I have some ideas on what to write about! Thank you for your words of wisdom and for helping me attack this writer’s block! Thanks for your response, Valentina. Eryn Kraning, the Director of Admissions here is an ESFJ and I know and love her temperament well! It doesn’t surprise me that your MBTI profile changed. Hopefully as are seasoned by life experience, our MBTI will get more balanced and even change. Not surprising at all. You still have that “T” in there too! I appreciate the kind words and so glad you found the exercise helpful with your application. Wow, I had taken this test in the beginning of my freshman year in college as part of a brainstorming session to see what majors might match up well with our personality traits and had since forgotten about it. Now as a college senior I came across your post and am really amazed at the ways I have changed and the traits that have stayed the same since I started college. Almost 4 years ago I was an INTJ, and now I am an ESTJ. I can easily see how I have switched from being more Introverted to more Extroverted: I hold officer positions in large student run organizations, tutor-mentor an underclassman who is struggling to adapt to college as a first generation student, and also started working at a job that requires me to talk to patients almost all the time. In high school I would have never imagined that I would be taking on these responsibilities; I was a student that preferred to work on things alone and would almost never speak in class. Being away from my comfort zone at a big university has allowed me to grow to enjoy collaborative thinking and meeting new people. These experiences also could have influenced how I went from being more of an Intuitive thinker to a Sensory thinker since decision making in these contexts requires a more concrete and situational basis compared to theoretical or broader contexts. On the other hand, I can see how I stayed classified as Thinking and Judging. Though I stayed close to the border between Thinking and Feeling, I can definitely say that given a new situation I would approach it with reason and distance than let my emotions or experiences control my choices. On the other hand, I strongly prefer to have rules and stability in my life than spontaneity and open-endedness. Though I do enjoy improvising and the fun that comes with it once in a while, I find that I tend to struggle with assignments that allow a great degree of creative freedom since choosing a direction to go in often takes a while. Thank you for writing this article and for all the advice that you have provided pre-optometry students! It has definitely given me inspiration to reflect on my own talents and qualities as I begin wading my way through the application process this season. PS: I had my younger sister take the MBTI test since she is getting set to enter college in the fall and can’t wait to see how much she has changed or hasn’t changed in the next few years! She is an ENTJ and fits the typology description exactly. Thank you for suggesting this test! I took it years ago, and it is interesting to compare my high school results with my post-undergrad results. I am an ENFJ too! While my typology has not changed, I noticed, however, my scores are more slight in the leanings, especially in the Feeling versus Thinking category. I am such an empathetic person, but I often pick ration over emotion. This leads to some “brain” versus “heart” clashing, but I like this about myself because I can see multiple viewpoints on a situation. I like than ENFJs are described as “bright” and “warm”. I would say I am filled with joy and happiness when I see those around me successful and happy, and I will always go out of my way to ensure people around me stay positive. I always tend to become involved in advising committees, counseling roles, and teaching jobs because of this personality, and I am thankful that those traits have brought me to challenging leadership roles. I also relate to “they get excited about possibilities for the future”. A lot of people I know are anxious about the unknown or where life will take them, but this journey is exhilarating for me. I do however sometimes focus on the future and planning instead of focusing on current tasks…I guess we all day dream a little! One of my favorite sentences in “The Giver” profile was “ENFJs tend to define their life’s direction and priorities according to other people’s needs, and may not be aware of their own needs.” While I pride myself on my ability to feel and want to support others, I have noticed in the past that I have sometimes forgotten about my needs. This has become a big focus for me over my undergraduate career, and I am proud to say I am learning how to take time for myself and how to take care of my mental well-being. It is so important to have a selfless love for others, but we also need to make sure we are caring for ourselves too! I love the constructive yet positive outlook of these personality types! Thank you for encouraging us all to understand ourselves better! Have a great day! I’m so happy you found the MBTI test useful. I can tell you’re an ENFJ because you use lots of exclamation marks in your narrative!!! By your own description and insight, you have a natural inclination to using your gifts as an ENFJ to fulfill your need to help others. Make sure to bring out this trait in your personal statement along with all the other positive qualities an ENFJ has for being a champion for people around him or her. Noteworthy is your comment about realizing that you are becoming more balanced in the T (thinker) versus F (feeling) trait. This is what maturity should help you with, namely to gain insight into when you need to be a Thinker and when you need to be a Feeler. You should be in the position to choose which trait you apply in a given situation and not act compulsively. That’s the beauty of this method because it helps one be objective about “shifting gears” with their traits–applying the correct skill when called for. Also noteworthy is the comment about how the ENJF, “The Giver,” needs to tend their own garden. Yes, balancing your time and being attuned to your own internal needs is something to be constantly mindful about. You can’t nourish your own branches and leaves if you don’t take care of your trunk and roots! Yes, every personality type has a contribution to make. I’m so happy to hear that you see how an ENFJ will make a great health care provider. First off, I wanted to say a HUGE thank you for being so active with students like myself that are going through this journey of applying to optometry school. It feels wonderful not to be alone and most importantly, I appreciate that you take the time out of your day to post articles such as the one above. With that said, I took the test myself to find the following results: ENTJ. It is amazing how accurate these results are! As much as I think I know myself, this helps me reanalyze what type of individual I am. I most definitely am a people person. I get my energy from interacting with others and receive most satisfaction by making someone else my priority and making them happy. According to the results, I have a slight preference of Thinking over Feeling. When it comes to working in a private optometry practice or interacting with my classmates in school, I completely believe being truthful is more important than being tactful. Does that make me cold hearted? Most definitely not! I think finding the balance between the two makes a well-rounded, caring individual. I am extremely caring and compassionate and believe that is the most irreplaceable talent I posses. When it comes to the “J”… words can not explain how much this describes me. As much as I work in bursts of energy and stay open minded, I like to have my things organized and I am very task oriented. Some laugh at my “to do checklists” but that is what helps me make my plans, be decisive, and accomplish my goals. It’s heart warming and motivational to interact with individuals like yourself who go above and beyond helping students like myself … aka optometrists-in-the-making! I wish I had more “T” in my ENFJ because I’d love to have more choice over when my emotions kick in versus my rationale! Again, to repeat myself, it would be the best MBTI profile of all to have balanced testing in all four categories, but alas, most don’t test that way. No, being a “T” or a thinker for sure does NOT make you cold hearted. In fact, the newfound objectivity you have just gained about this tendency is just what you need to call yourself out and make certain you are mindful about NOT being cold hearted or indifferent. That’s why the MBTI is so powerful because it gives us a way to understand our strengths as well as our shortcomings. I am constantly saying to myself, “Jane Ann, you know how you are.” The sooner you can recognize errant thinking in yourself, the sooner you can correct and thus fine tune your reactions to any sort of situation. I talk to myself by saying, “Don’t take the bait,” meaning that I KNOW how I am and I make sure I’m in the moment enough to correct my behavior before I lose objectivity. You failed to mention one of your BEST qualities as an ENTJ, and that is your ability to be a leader. In some MBTI profiles, your type is labeled as the “Field Marshall,” being decisive, forceful and ready to size up a situation and leap into action. My son is a true ENTJ, and I know him well. As a boy, he had all the kids at our house, ordering them around, producing plays, setting up play combat for armies. He’s still like that–a force of nature! He was a strong force to deal with as a kid, but you should see the adult he turned into (Google Jim Munroe and Maze to see what my ENTJ son does for a living!). So you have A LOT to bring to the table!!! I tell you, it’s like finding gold buried in your own backyard…! Way to go optometrist-to-be Magdalena! My apologies for mispelling your name in the above post, Dr. Munroe. Sometimes I get so into my work, which in this case was the post, and my excitement gets to me! Thank you for your kind words and yes, my best quality as an ENTJ is my ability to be a leader and lead myself as well as others through this “MAZE” aka journey to optometry school!! No apologies necessary! Everyone spells my last name that way…! I get the “MAZE” comment too, wink wink! First of all, thank you so much for the guidance in not only how to start answering this question but also being able to see whether optometry is a good fit for me! I really also enjoyed being able to discover more about myself through this process. I wanted to share with you that I am an ISFJ. I am almost equally split between E and I but I lean a little more towards the introversion side. I realize that I really do resonate with what the website had to say about my personality! As an ISFJ, I have a strong sense of responsibility with the tasks that I am given. I will follow through with my duties. I am also very aware of other people’s feelings so I am quite sensitive towards them. The portrait also says that ISFJ’s are warm and kind-hearted, wanting to believe the best in people. It was really cool being able to learn these things about myself! I feel more confident in pursuing optometry because I think that these traits are good for working with others. Thank you again for putting this article out, Dr. Munroe! Thank you Valerie for your reply. I always appreciate when an applicant takes the time to share their experience with the process. First of all, it’s common to have an E/I split. Being on the Extrovert/Introvert spectrum is not inconsistent with the MBTI profile. Being split in the S/N or the T/F category is more difficult because they are polar opposite qualities, but not so with introversion and extroversion. Remember, introversion is not “shyness,” but rather a way an individual processes information (being externally and verbally for the extrovert and internally and in typically a non-verbal way—thinking, writing…etc.—for the introvert). The ISFJ is an EXCELLENT profile for optometry. You hit the nail on the head when you observed that they are good with people, have a strong sense of responsibility for completing tasks and accepting responsibility—key for being a steward of patient care. The F/Feeling part of your nature will naturally override your introversion when you have a patient who needs your care. I am so happy to hear that you are realizing qualities inherent in your temperament. Wow! In MBTI “shorthand,” you are an “SJ.” This shorthand is a basic 4 category distillation of the 16 MBTI types (SJ, NF, NT, and SP which is how I read people when I first meeting them). SJs are duty-bound, feeling a deep sense of responsibility for people/projects put in their care. They are tuned into their environment, typically very detail oriented. 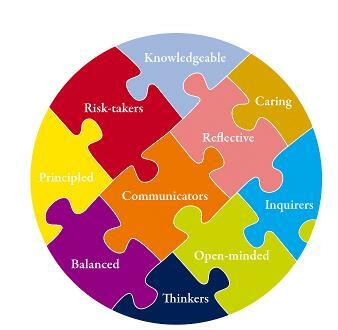 Great attributes for a doctor! Eryn, my right arm here in Admissions, is an ESFJ, which is basically what you are with a little more extroversion. She is GREAT with applicants, sometimes picking up on the finer details, whereas being the ENFJ that I am, tend to be errantly pathologically idealistic. She keeps me in check and we make a great team because my “S” (being tuned into the real world) is very underdeveloped. I’m working on it though! You’re welcome to this resource. I love hearing tales about those who have discovered their onboard assets because it has been my experience that most take this “gold” for granted and miss the obvious talents they bring to the table. Assistant Dean of Admissions and MBTI Enthusiast! At first, when I saw the prompt to this blog post, I was extremely excited to know that I was not alone in thinking that this prompt was by far the most difficult to answer. To truly answer the question, I completely understand why it is important to learn more about your intrinsic and innate characteristics. I wholeheartedly agree with the statement above, as I am constantly working toward new goals. I feel that this trait as well as the “dependability” trait that ISTJs have are great for an optometrist. I would love my doctors to be dependable and try their hardest to tackle any questions or concerns they may have about my eyes or vision. Again, I wanted to thank you for allowing me to take a different approach to the question. In the next couple of days, I hope to answer this question to the best of my ability, incorporating traits I did not even know I had or traits that I did not think could contribute to my future profession. You’ve stated beautifully the greatest asset of the ISTJ relative to being a provider of care, and ISTJs are the just how you described them. If I were ever really sick with an illness that was difficult to diagnose, I’d want an ISTJ on the job. 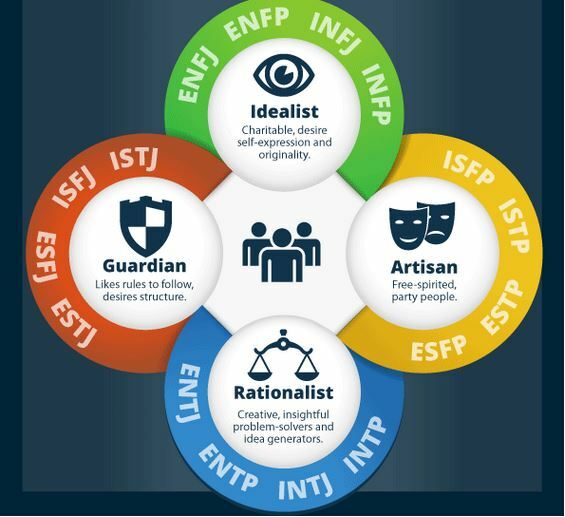 They are the most logical thinkers of the MBTI profile, being very adept at working through big problems that require integrated and precise thinking and follow-up. In the MBTI world, they are profiled as being great judges, administrators, and trustees—”keepers of the flame” would be a good way to describe the ISTJ. Having the “I” (introvert)combined with the “T” (thinker) will require you to put forth extra effort when it comes to both newly meeting and interacting with patients all day. The introvert who is a thinker loves to head for their favorite secluded retreat to think their thoughts, work through problems, and really, decide internally how they relate to issues. You’ll have to practice thinking on the fly because that is what is involved in patient care. Your introversion isn’t a problem when it comes to relating to people because in social settings or in patient care, when you get the introvert talking about something they are enthusiastic about, they turn into an extrovert—for patient interaction, optometry will serve its purpose turning your “I” (introversion) into an “E” (extroversion). I commend you for taking the MBTI test. It is the ISTJ who tends to be a skeptical about any subjective testing—you’ll find this out when you start examining patients like yourself. In addition to being keepers of the flame, ISTJs make great engineers; any optometrist knows that the “which is better, one or two” question bugs the heck out of them! “Which is better, one of two? Upon what criteria do I base my answer? It is clarity of the borders or correctness of the letter’s shape?” Oh brother! Yes, the ISTJ would be perhaps the least likely to take the MBTI profile test, instead seeking data about the validity of the test and how to administer it properly. Hee hee! You can tell I’ve tangled with an ISTJ or two in my lifetime! But again, if I were ever really sick with an undiagnosed illness, get me the ISTJ! I’m so glad you found the traits inherent to your temperament that will make you a great doctor because the ISTJ has much to offer as a care provider. Thanks for letting me know you enjoyed the article. Thank you for this article and your insight in approaching this daunting question. As I read my profile, I kept visualizing the many times I felt I wanted what was best for that person, to be an advocate for their success and to help them achieve their goals anyway I can. I learn more about myself each time I read through my analysis. I couldn’t help but read the comments provided by prospective students and your comprehensive responses. I am curious to hear your thoughts about my results if you would take the time! I have taken my MTBI profile several times. First, I learned about this test during my Intro to Psych course as an undergrad; my MTBI profile was INFJ. I took it again several years later for a work training and got INFP with a 1% preference for Perceiving than Judging. I took it again after reading your article and got the same profile as you, an ENFJ. I learned in class that, for the most part, your letters don’t change. I think I identify the most as an ENFJ but notice that I switch between ENFJ and INFJ. These results and in reading your insights also helped me work through what I might want to do in the future. I have worked as student aids, tutoring for math, and teaching preschool. As rewarding as these experiences were, they were tough to do. I really thought I wasn’t fit to be a teacher because I felt too emotionally taxed when I see students struggle and blame myself. These thoughts held me back from the possibility of pursuing academic teaching with an OD degree in the future. There is much to think about and thank you for allowing more doors to open. Yes, you are one of my “peeps,” a fellow (E/I)NFJ. I would love to give my comments. First off, let me correct your assumption that one’s MBTI profile does not change throughout his or her lifetime. Not true. That said, for the most part, one’s hardwiring is innate; however, when one takes the test, he or she could test to be fairly split between the two designations so that when they take future tests, he/she may appear to test as the other “letter” (category) when in actuality, life’s circumstances may be influencing him/her in a way that has him/her test just very close on the same spectrum but score a different category. For example, my daughter is the most balanced person I know. She has a very balanced temperament, especially in the categories of introversion versus extroversion, feeler versus thinker, and perceptive versus judging; when she took her MBTI, she scored almost 50/50 in each of these categories. However, she’s a strong “S” (sensate), meaning that she isn’t an intuitive processor and with repeated testing, always scores about 75% in this category of sensate (S) (the opposite of intuitive or N). For me and where I can be better about teaching myself to be more balanced, I am trying hard to not be so “J.” I love to have decisions made; I love to see made-decisions in my rear view mirror! However, not taking time to sit in the tension of an unmade decision can lead to impulsive decision-making and rushes to judgment. I constantly check myself in this area. But, I can’t do this myself with my “N” versus “S”–I need outside input. I think it is very easy to be both an extrovert (E) and an introvert (I) given the social situation; however, the introvert will always prefer to process information internally and need peace and quiet to do so. Extroverts process by bouncing things off other people and getting feedback–just like a bat flying by using sonar feedback in the dark. I think one can learn to function as either an introvert or an extrovert at will, given enough awareness. I do not think anyone should even consider a future career without insight into his or herself without using tools like the MBTI profile. I think you hit the nail on the head for why being a teacher was hard on you. NFs are idealists to the MAX! We love people too much to overlook failures, and we would have to do just that in dealing with them one on one as a teacher because not all students succeed no matter how competent the instruction. An ideal teacher, IMO, would be an ESTJ or ESTP. Being a doctor is so much better for the NF because you are dealing with a person in an idealistic way, with the intent for their highest good AND you have the chance to deliver because you are the steward of their most precious sense, their eyesight! Us NFs LOVE that role! NFs make great counselors and pastors as well as good doctors. In these roles, we get to champion causes and that is right up our alley! Thanks for taking the time to reply to my article. I’m so glad you found wisdom in it. I am really glad I looked into this personality test (based on your suggestion during the virtual fair). It was helpful not only with the writing part of the application process but also in my relationships. I made my husband, siblings and parents take it =) and it helped us recognized our strengths and differences and discovered qualities we possessed all along. Thank you for sharing. In short, I am an ENTJ/ENFJ (with a 1% to no preference of thinking over feeling). My husband ISTJ. Most of the time I am an extrovert. I thrive off of interacting with other and being the one with the latest and newest information. However, about 15% of the time, I retreat in a corner to process my ideas and daydream about my family and career plans. I believe the small introvert part of me comes from the fact that English is my second language. I think in Romanian before I speak in English and at times it’s tiring having to go back and forth. My husband is borderline I/E. I pride with my gifts of compassion and empathy. I believe they are the most important contributions I will bring to the SCCO family. From a young age I have been able to intuit and subsequently show consideration for the needs of others. Pattern recognition occurs very naturally for me. On the other hand, my husband is the sensing type. Devoted, punctual, very learned, methodical and traditional are words that describe him. When it comes to decisions, I tend to personalize them. I give credit to my husband for bringing me back to sea level sometimes when I stray too much from the hard facts. He gives more weight to logic and the bare truth. Both of us have a very strong preference for judging. We enjoy structured lifestyles. We are somewhat flexible and open to new information, but most of the time we plan ahead. Sometimes we have a hard time connecting with perceiving couples at church. First of all, I would never have known that English is your second language. You show a wonderful command in your writing. Yes, knowing others MBTI profiles helps all relationships–business and family. I’m glad you discovered this. As a strong “N” myself, the biggest rub I find that SJ types have with the NF is that they think we’re dreamers and oddballs. Perhaps I should speak for myself! =) Sounds like the two of you work well together as a team–that’s wonderful. I hear the T and F in your analysis. I have a lot of T in my ENFJ too. Balance is always what one strives for! I’m glad you benefitted from the results of the MBTI profile testing. I hope one day you can apply it to patient care. I was first introduced in more detail to your blogs thanks to the virtual fair yesterday, and I have to say this information has made such an impact on my hopes of being able to attend SCCO. But anyways, I got the ENFJ as well and I also believe this is truly accurate in not only my social life but also in my spiritual walk as a follower of Jesus Christ. I am so grateful for you Blogs and YouTube videos! It has been a pleasure reading! It was nice spending time with you yesterday at the Virtual Fair! Hope you can tell that Eryn and I love to help applicants accomplish their goals. So you’re a fellow ENFJ!!! I wouldn’t change my MBTI profile for anything. It’s the best part about me because it keeps me idealistic and forever a believer in the potential of the human spirit. I am in a master degree program now in spiritual direction at Claremont School of Theology. My goal is to do retreat ministry, many of which I have led already and now I am making a concentrated effort to get more education to continue. Shorthand for your Myers-Briggs type is an “NF,” who are idealistic feelers. I’m in school with a whole bunch of NFs and I love to be surrounded by them. Only 25% of the population is N, and so we’re a little bit of a rarity. You will make a wonderful doctor because, down deep, you can’t do anything less than champion a cause, whether it be a big one, or a small one (aka a patient’s care). I feel like I know you!!! Thanks for the kind words of praise. Eryn cringes when anyone mentions that they’ve been watching us on YouTube; our videos are a little campy, but all I had was a cheap movie camera and a desire to help. Sorry about the long excerpt, but I’ll admit that there have been more than a few instances where I agree to doing things because I feel like I should, and although it usually ends well the process itself tends to be stressful. Having this pointed out to me made me realize that there were some things I should have tried to say “no” to this summer. At the very least, I can now use this knowledge for future decision-making! Additionally, I’ll admit I was somewhat shocked when it said I was an introvert. I associated this with problems communicating with people until I read, “They prefer to work alone, but work well in teams when the situation demands it. They like to be accountable for their actions, and enjoy being in positions of authority.” I definitely had the most fun in undergrad when I held a position of authority, and I definitely enjoyed interacting with other board members to make it work! Overall, I think this helped me solidify where my strengths are and also helped me realize where I can improve. I’m glad I took this test! I’m working on my applications now and, like most everyone else, am struggling to answer the big question about my contribution. Thank you, Dr. Munroe! I hope to have a good answer by the time I submit my application. Thank you Joan for taking the test and the time to write out your comments. First off, I’ll say that the ISTJ is one of the least likely profiles to take this test and believe in its wisdom; so kudos right off the bat for being so open to giving it a try. As the ISTJ pertains to what you might contribute to a community you join, all I can say is you’re the perfect example of WHY I took the time to write this article! You just don’t get what you have to offer in terms of your inherent talents. ISTJs are the ultimate “trustees” of any group or cause. As far as the spectrum of being responsible, accountable, duty-bound, and balanced in critical thinking skills, the ISTJs take the cake. Dr. Lorraine Voorhees, our VP of Student Affairs, is an ISTJ. She has faithfully served as an administrator at SCCO going on 42 years. As they apply to service, constancy, and longevity are bywords for the ISTJ. As far as the contribution you would make to a program, it would surely be along the lines of administration as perhaps an officer in a student organization or student governing body. In the future, you may professionally serve as a administrator or trustee. I know those are lofty goals to put in a personal statement, but take it from me, with the proper substantiation from your personal life, and since you are the self-admitted “go-to” person who people obviously are relying on to get things done, I’d take the risk and describe this desirable characteristic in your personal statement. Even though I want to be, I’m not a go-to guy! I have to muster every force inside me to be a go-to guy! Eryn, the Director of Admissions here is the my go-to guy and I need her because I am the dreamer and visionary. Are you getting the picture? All dreamers need the trustee, the implementor, who will, step-by-step, help their abstract ideas become realities. That’s what ISTJs do; and not, may I say, without giving us dreamers (me, I am the ENJF) a little grief before they cave in and help with planning and implementation. If you look at all the advanced civilizations of the world, it was the ISTJs, the “worker-bees” who stepped up to make sure everything continued to operate according to plan. Am I making my point?!? To conclude, I’ll say that you hit the nail on the head when it came to understanding the difference between what an introvert is versus a shy person. They are not the same! Shyness is somewhat of a pathology. It has nothing to do with being introverted. Introversion refers to how one processes information. The introvert “goes inside” when faced with a challenge. They need “closet time” to process information. They don’t want to hear what other people have to say until they’ve had time to think about the topic for themselves. The shy person can be an introvert or extrovert, but bottom line, they are not comfortable interacting with others. Extroverts cannot work their process without bouncing things off other people. Boy, do I KNOW this type! I just about want to burst when I have a new idea or concept that needs analysis. It’s virtually impossible for me to do this without running ideas and perspectives past another person for their reaction. Sounds like, by this definition, you recognize yourself as the introvert-internal processor. So my answer is to embrace your gifts as an ISTF as the salt of the earth, the worker bee, the trustee, the one who implements for others. You have many gifts to bring to the mix. It would be just like an ISTJ to discount all of them. It’s time to toot your horn!!! As I was working on my application, I came across this question and was having a hard time thinking of what I should put. I decided to check your guys’ website for a post and, sure enough, here it is! As always, thank you so much for all the help! You and Eryn are absolutely amazing. You two are so kind, sincere, and enthusiatic. SCCO is lucky to have you guys’! p.s. tell Eryn that I say hi! I love getting comments like yours! You’ve discovered qualities you have possessed all along and didn’t even know it; but really, you did know it, you just didn’t stop to think about them as assets. You’ve so wonderfully described the ESFJ in your quote. They are feelers who love people, and the “J” gives them the desire to externalize these qualities in their natural ability to want to help people in VERY tangible ways. When the ESFJs of the world see a need, they are compelled to respond with compassion. They are the ones who are first to console friends with loss; they are the ones who can anticipate people’s needs. They are the first responders in any kind of crisis. They make wonderful doctors. BTW, Eryn is an ESFJ too, which is probably no surprise to you since you’ve been interacting with her. She’s the first to send comforting messages to any member of our campus community should there be bad news. I had a stomach flu thing this summer and she was over to my house in a shot with 7-up, soda crackers, and meds for nausea. That’s what the ESFJ is like. Thank you for taking the time to write your comments. To the ENFJ like me, we love to hear that we’ve inspired someone with our message! Thank you so much for posting this article about the MBTI. As I sit here trying to write out my thoughts for my application, I found myself getting stumped by the question “what is the most important contribution you hope to make to the SCCO family?”. Your advice about using the MBTI made me realize that I have more to offer than I had originally thought. My MBTI is ISFJ (introverted, sensing, feeling, judging) or the nurturer. ISFJ’s are supportive, reliable and patient, imaginative and observant, enthusiastic, loyal and hard-working and have good practical skills. I think that this suits me well because I am always searching for ways to provide for people’s needs and to help them in any way possible. Thank you for the advice about using the MBTI and for helping me move one step closer to becoming an optometrist! Thank you for your interesting post! I am in fact an ENFJ as well! I used to be skeptical about taking personality quizzes because the idea of having to generalize myself in a “yes or no” style answer essentially gave me anxiety and I always found myself thinking “well sometimes yes, but sometimes no!” and then my results would not be accurate because I didn’t pick right one. But this quiz was so accurate!! This is so true. I find myself constantly in deep thought and it is not only about how my actions can change my community, but how they can change the world! I’m always thinking at a global level. I found this sentence to be such a coincidence, because I essentially talked about how my international travels have inspired me to want to attend optometry school in my personal statement!! I couldn’t believe the accuracies, so thank you for restoring my faith in these quizzes! Also, who wouldn’t want to be compared to Oprah, right? One last thing…I have to comment on how welcoming and helpful I have found SCCO to be during my application process. Being from Toledo, Ohio, I have found the website to be my key resource during this process and WOW! how amazed I am at how much you guys care about the PRE-optometry students…this gives me a great idea about your care for the success of your actual students! I felt so at ease while navigating the SCCO website and how welcoming you guys were! I haven’t had an experience like this yet! It makes the thought of traveling across the country for optometry school that much more exciting!! Thanks again! Thank you for participating in the dialogue about MBTI profiles Noor! As you pointed out, I am a fellow ENFJ. I loved your quote about ENFJs and their focus being ‘expansive.’ My fellow admissions officer, Eryn Kraning, would laugh at that euphemism because expansive when referring to focus is oxymoronic! Yes, we are idealistic, we love people and ideas, and we do have an expansive interest in all things related to humanity–that’s for sure! Let me make one observation. MBTI profiling is not a trendy quiz. It is well-accepted by the psychological community. I know you meant no harm in the comment; I just want to make certain that my readers know that I would not advance any topic in my blog that was part of the parlance of pop culture. For my daughter’s orientation to the University of Vermont School of medicine, as a 1st year medical students, she was required to take the MBTI profile with the goal in mind of helping the med school students discover their innate likes and dislikes in the hopes of helping them discover what residency training they would eventually be drawn to. The Myers-Briggs is the real deal! Thank you for the kind words of praise about our website. Given the product we are using, Eryn and I have worked to format the website to be effective help for applicants and the admissions process. We’re especially here for students making a big move to attend optometry school. We have a mentor-mentee program for that very purpose, along with a Facebook Group formatted for each incoming class. You’ll have plenty of help! Thank you for the clarification! I can definitely agree that the MBTI is the real deal! My results were so accurate, and they confirmed things I already suspected about myself and made me think deeper into other characteristics. I enjoyed this test so much that the next day I presented the idea of taking this test as a class to one of my counseling professors, and she loved the idea! We’re going to discuss as a class what was confirmed from this test, and new things we have learned about ourselves! Thanks for the great idea!!! Thank you so much for the post! I have always loved personality tests but didn’t make the connection to use it in my personal statement. Like you, I am an ENFJ and loving it. It’s funny because the phrase “I want to help people” seems a little standard, but really, I am in love with helping others. The test helped me delve deeper into the origins of this very natural instinct. Seeing “potential in other people,” and tending “to personally experience the feelings of others,” are two major factors that drive me in what I do! With this knowledge, I now have a better foundation to express my motivation as to why I want to be an optometrist. My only concern is that the test doesn’t talk very much about being in a healthcare related field. It speaks more about being a teacher. 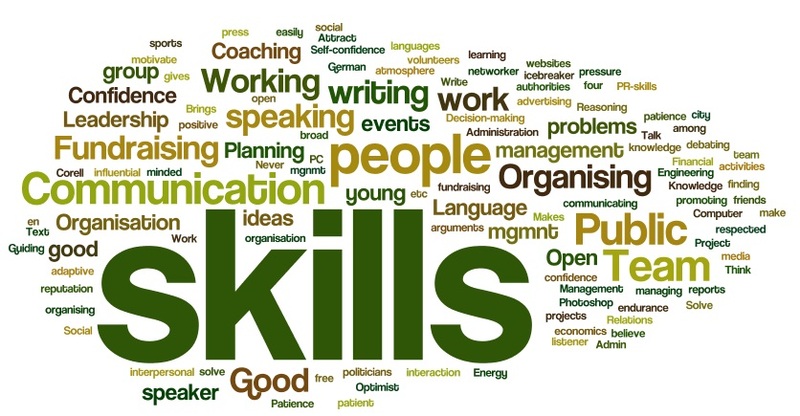 But excellent teaching skills can be extremely valuable in any field. The ability to evaluate a person’s emotions, effectively communicate an idea or concept that makes sense to him or her, and see the potential in every situation seems to be very helpful. But being an ENFJ yourself, how do you think ENFJ’s traits are useful to optometry? A fellow ENFJ! I love it! Of course you know that we “NFs” are the ones who believe in human typology profiles and so of course, my article will naturally attract NFs like you to its content. You don’t know HOW much you said with just your opening hypothesis: “It’s funny because the phrase ‘I want to help people’ seems a little standard, but really, I am in love with helping others.” Being the NF that you are, you most likely judge this proclamation to be what every pre-health applicant feels. Not so! This phrase pops off the page. It says to me that you are the kind of person who will persevere in the patient/provider relationship. That is a wonderful quality to bring out about yourself. Use it! OK, now for my main point: getting an education to be a healthcare provider, especially a doctor, is scientific in its nature; HOWEVER, practicing optometry day in and day out is not as much scientific as it is being a TEACHER! You could potentially have 30 patients in a day, all with the same vision problem, let’s say astigmatism. Your job is not “scientific,” that is, diagnosing this VERY common problem. Your job now becomes one of helping the patient UNDERSTAND what their problem is, how it impacts him or her visually, and conveying that you can indeed relate to his/her frustration when he/she cannot sustain a visual task comfortably. You have to adapt your communication, your very language to what that patient is able to comprehend so that you succeed in teaching exactly what needs to be done to solve the problem, which will be very different for say a 7 year-old Caucasian male raised in a middle class family versus an 80 year-old Hispanic gentleman coming from a native culture. Get the picture? In short, you are no longer the scientist, you are now the teacher, the educator. So, besides being a good teacher, a great counselor, NFs are champions of the human being! As and NF and to a fault, you will see the best in your patients and they will love you. You will inspire patient loyalty. Because you will keep up your education current, you will inspire trust in optometry as a deliverer of primary healthcare. You will go above and beyond to make sure your patients get the best care possible and won’t be personally satisfied with anything less. Remember, patients don’t care how much you know until they know how much you care. The NFs in our profession are especially gifted at conveying the trust in patients and delivering care–plain and simple! You’ve hit the mother lode! Now put it into language that will give inspiration to your personal statement. Oh my goodness Dr. Munroe! Thank you so much for that insight!! Thank you for alleviating my worry about “helping others” being too standard. It’s nice to know how things will be perceived! I also had never considered how important being a “teacher” is to patient education. It just makes me all the more excited!!! I took this test a long time ago, since as a little girl I have always been interested in Horoscopes, Astrology, and personality tests. Just wanted to share my result as an INFP – it’s amazing to think there are only 4% in the world, and it’s true when I find someone that embraces the same values that I have, we are stuck together for life! In my patient interactions I am quick to be able to decipher what kind of personality my patients have, and I always cater what I say and how I say it to what I think would work best for them. I take great pride in my ability to get along with everyone, and love chit-chatting with patients about what’s going on in their life. No doubt, knowing these qualities about yourself over the years has helped you to learn more about your inherent gifts and how to maximize their efficacy when dealing with people. Because of their idealism and optimism about people, many INFPs serve in ministry and as counselors. My best friend is an INFP so I’ve seen those sensitive, salt-of-the-earth qualities at work over many years and I love this person greatly for being such a champion of people. Along the same lines, optometrists do a lot of patient counseling for which you will be most suited and find tremendously rewarding. Thanks for reporting back to me. I LOVE to see the lights go on when a young person discovers their inherent buried treasure–of course I do because I am an ENFJ!!! I just took this test and discovered that I am an INFJ. I was shocked to discover that I am among 1% of the population that has this personality trait! As I was reading the description, it was the most accurate portrait I have ever read of myself. When I told my friends and family about the personality and its traits, they couldn’t believe how accurate it was. I’ve even convinced my mom and dad to take the test, so that we can all learn how to work together as a family. It was great to finally understand things about myself that I had never attributed to my personality. For example, the fact that I always have a few close friends, but never many more. It also pinned the nail on the head that I am a perfectionist who is always striving to be better (which can be a weakness in itself!) It even mentions a “consistently messy desk”, which is so characteristically me, as both my parents and my roommates can attest to. Thank you very much for writing this article and really all of your articles. I am applying to optometry school this year for the 2014-2015 cycle. Your articles, blog posts, FAQs, videos, etc. have been invaluable to me throughout this process. I am so beyond excited to meet you and continue in my dream to become an optometrist! I can’t wait to start this next chapter in my life! You can’t imagine how excited I get when someone connects with their MBTI profile! The “NFJ” part of you is the same as my profile, but you are an”I” (introvert) while I am an “E” (extrovert), and so I understand the “NFJ” part of you very well because I live it. Myers-Briggs has created a streamline version where every type can be boiled down into two of the dominating characteristics. The four condensed versions are: SP, SJ, NF, and NT. First off, as you noted, your type is rare because to begin with, only 25% of the population are Ns. We Ns live in their heads! As such, taking someone like you who is an N and adding the I (introvert), you have someone who is comfortable spending time alone, doesn’t need to run things by other people, and has a rich, what I call “head life.” Someone who is very content romping through the fun and imagination in their own mind has little need for an organized desk! It’s the Ss who crave order in the exterior world surroundings, and so they have judged your desk as messy. A Ns desk would be “messy” if it were a place of confinement through too much order, which would interfere with exercising the imagination. It’s through your intuition that you relate to people. INFJs make wonderful counselors, which is really what a good doctor is. They have to make a diagnosis but most importantly, they have to motivate the patient to take good care of themselves. INFJs (and ENFJs) truly love people and will champion their causes. I gotta warn you though: NFs and NTs are oddballs and airheads (of course as regarded by the opposing types, especially SJs). I’ll admit that I am a real airhead sometimes. I romp around in my head going down one rabbit hole after another until someone retrieves me out of my trance, where I usually respond with my typical, “What? What did you say?” I don’t mind being dubbed an airhead though because we’re in good company: Walt Disney, Oprah Winfrey, Abraham Lincoln, and Martin Luther King just to name a few NFs. We are not the performers (those are the SPs–the movie star types), but rather, we are the feelers, the idealists, the human conduits. Can you tell I love my NF-ness?!? I seek out NFs because they are hard to find. Yep, we’re rare. 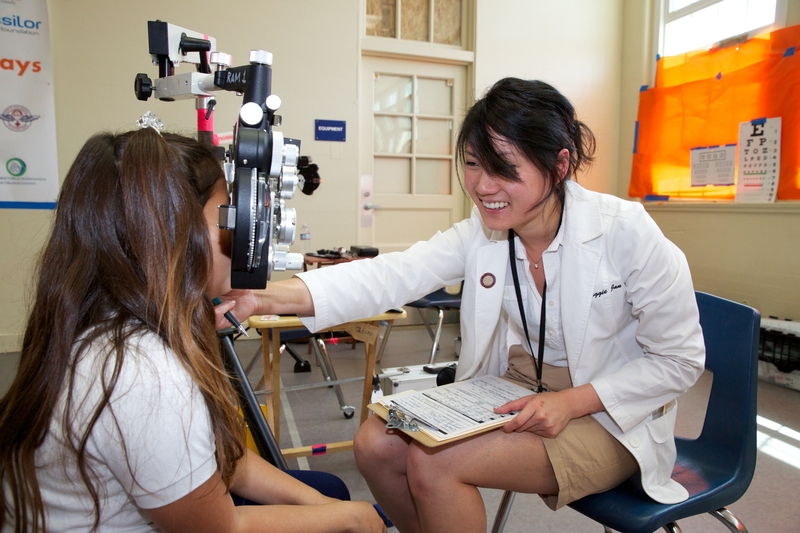 You are poised to bring a lot to the table as a doctor of optometry. I am SO HAPPY that you want to learn more. Here are the books you need to read in this order: “Please Understand Me” by David Keirsey, but the one that explains the shorthand version and how types interact is “Please Understand Me II,” by David Keirsey. These books have changed how I relate to and behave with other MBTI types. Your family would benefit from learning each others types, which I think is very helpful for parents as they transition away from viewing you as a child into respecting you as an adult with your own ways of thinking and interpreting your world. Have fun! You’ve discovered a whole new world that will provide hours of interest for that NF feeling imagination of yours. I really enjoyed this affirming exercise. As an ENTJ it really hit home and helped me to reassess my strengths and weaknesses in a very succinct fashion. “Driven” and “hard working” are definitely strengths I know I possess. I believe that these are excellent qualities for any health care provider and will serve me very well in the optometric field. These are the characteristics that push me to continue improving myself and will help me provide the best care possible to all of my patients. I know I would never feel comfortable settling for anything less from myself. My tendencies to be analytical and resourceful will also be great traits when it comes to diagnosing patients and determining the best treatment or further course of action (be it personally researching further into more comfortable, alternative options for my patients or knowing who to contact or where to go to refer my patients to the appropriate specialist). “Critical” was also listed for the ENTJ. I feel this is a double-edged sword. While I maintain high standards for myself and others, which is something I believe everyone should have, these standards, combined with my critical nature, can build stress when patients make choices that aren’t always in the best interest of their health or when I feel I have not performed to the full extent of my capabilities or potential. This critical judgment is something I am constantly working to find a balance in, as I continue to recognize it as one of my driving forces to succeed. So while I would like to keep it in check to have things run more smoothly, I also believe it has its own very important, undeniably positive aspects. Throughout this application experience, what I would like most is to thank you and Eryn. I loved watching your youtube videos and have never felt such a wealth of warmth and support from a program’s staff. It is actually what first attracted me to MBKU. After submitting my application over the winter, I met with Eryn and she gave me a lovely tour of MBKU’s campus and facilities. I felt like she really took the time to cover everything MBKU had to offer and she was just as awesome in person as in the videos you hosted together. I hope we can meet soon, as I believe a thanks in person would be much more proper! Thanks for taking the MBTI profile test and responding, Van. My son is an ENTJ, so I have had personal experience with this profile. BTW, Steve Jobs and Bill Gates are ENTJs, so you’re in good company. Intuitive, out-side-the-box thinkers, who are able, through their people skills and driven nature of their J, to get their ideas actualized into tangible objectives and then accomplishments. You will be great at patient care. Your second paragraph brings up 2 things I would like to address with you. First, the term “critical thinker” has a negative connotation and that is too bad. I prefer the term “analytical thinker,” meaning that it’s a benefit/skill to be able to take information, break it down, and apply an appropriate analysis and therefore draw logical conclusions from it. This is a WONDERFUL quality. And second, being “critical” is only negative when you do it without feeling, without compassion and empathy. If you feel that you are critical and judgmental when the situation calls for compassion and empathy, then you have homework to do! This is what I want to tell you based on what you have learned about yourself so far: if you apply analytical judgment and reason to situations where you should apply compassion and feeling, then you need to cultivate a different response. For example, if a friend has been hurt by what you thought was her good-for-nothing boyfriend, it’s not the time to be analytical as in “I told you so.” No, your first response will be one of compassion and understanding. As she is ready after healing from the trauma, then, and only with her permission, do you help her understand the red flags perhaps you see in her boyfriend, and how she can apply that logic to future dating experiences. See the difference? The difference is that if you apply reason and analysis to situations that require compassion and understanding, then that is unhealthy. This will be especially important with patient care. A typical example would be, let’s say patient whose glaucoma is not controlled. You ask about how they take their glaucoma drops. If they confess, with openness, that they have been bad about taking their medication, and you lecture them about how foolish their actions are, you will NOT be working toward your goals of being a caring doctor or towards getting them to comply with your instructions and take their meds as directed. This is a situation where you must use more of your F(feelings) rather than your T(thinking) and try to identify with them as a human being, and help them still find the motivation necessary to take care of their glaucoma. It’s applying BOTH qualities that will make you a TERRIFIC care provider. My point is simply this: use the MBTI to relish in your strengths, but also to reveal your weaknesses and works towards finding ways to be mindful of them and compensate for them. I trust that the VERY fact that you took this test says to me that you want to learn more about yourself, and therefore would be open to learning behaviors that will compensate for your weaknesses. Every MBTI profile has them! Thanks again for taking the time to share your results with me! Thank you especially for the lovely and kind words of praise you gave to me and Eryn–ABSOLUTE proof that you have a feeling, sensitive side to balance your analytical side. I wish I had more of an analytical side! I would LOVE that! Thank you again, Dr. Munroe. Your analysis and passion to support students and bring understanding is inspiring. I deeply appreciate the obvious time and care you put into your reply. Your analysis of my weakness is spot on and it is definitely something I have been working on throughout my personal and professional relationships. What I find most helpful for me is to stop and think about exactly what and how I would like to express my thoughts, stop again, think about whether or not it is the appropriate time to express those feelings, and, if not, reassess the situation for a more beneficial alternative. While this may seem like a slow process, it is definitely an area I wish to develop and feel is well worth the time spent. Thank you again for your words, from which shows a great knack for analysis! Perfect plan Van! Really, just what I would expect a “T” to come up with: a protocol for expressing feelings! I love it! You’ve given me the perfect segueway into the next article I am working on, namely MINDFULNESS. In the example you described, you are forming your feeling response with intentional mindfulness with respect to considering ahead of time how it might be received. I have been researching/writing my article on this topic for about 3 months and should be ready to blog post it next week. It’s my answer to how applicants should handle the anxiety inherent in the admissions process. I’m promoting the idea that one can respond rather than react. You’ve provided a PERFECT example of how one can be mindful when forming a response, and not just a reaction, which would have been your response had you not gone through your mental exercise. If you want to get a sneak preview into mindfulness, check out this blog entitled “Mindfulness, MD” http://www.mindfulnessmd.com. This young man is a 4th year medical school student who is candid about his struggle with anxiety and OCD (obsessive compulsive disorder). It was his mindfulness training that helped him. He JUST happens to be my son-in-law, and I share his passion of this topic. Hi Dr. Jane Ann Munroe! I may be a little late to join the discussion on our MBTI results but I just wanted to share my own results as I am very surprised at how accurate it was! I am ENFP, “the inspirer.” Some specific points that related to me were: “ENFPs have an unusually broad range of skills and talents. They are good at most things which interest them. They live in the world of possibilities, and can become very passionate and excited about things. Their enthusiasm lends them the ability to inspire and motivate others.” A lot of my friends and co-workers tell me about my bubbly personality and how it brightens up their mood. I guess that will be needed during exam times, haha! Also, I do have that habit of starting endless number of knitting/crocheting projects. It is both good and bad; good that when I do finish, my family and friends have warmth… bad in that when I don’t finish, yarn is everywhere! Thank you so much for all your insight! This test was a fun activity to do while taking a break from my studies. As for the answer to the big question, I will have to put that in the back-burner of my mind. Thank you Alison for your comments. It’s never too late to enter the conversation because this is one of my FAVORITE topics. You recognize your strengths in your relationships with your friends, and you are right on. Extroverted (E), intuitive (N) feelers (F) are very invested in others, seeing the best in their fellow man, and bringing out the best in them. Now, apply that quality to patient care and you have something to write about in your personal essay. There is no better guarantee that a healthcare provider will be motivated to provide diligent and expert care for a patient than being a bona fide believer in the human race, loving and caring for humanity in general. Now, about the “P” part of your personality. For us “Js,” with our strong desire for closure, feel that the “P” stands for procrastination (that’s an MBTI inside joke). Not so! The “P” stands for “perceiving.” That “P” drives you to keep your options open, not rushing to judgment, needing always to collect more information before being forced to close out a decision. I have a very strong “J” and so I am constantly trying to be more “P” by “letting it ride” and letting things play out before I force faulty judgment in haste. The goal is to try for BALANCE, either applying quick decision-making or withholding judgment, keeping one’s options open—which ever best applies to the demands of the situation at hand. Mindfulness, being intentional, getting some space to look at one’s actions objectively, is the ultimate goal. I’m writing an article right now about mindfulness and how it will help a professional student, not only through the admissions process, but through professional school and on into patient care. We need mindfulness to be able to create a space, a vantage point, where we can look at our behaviors objectively and if necessary, modify them. It’s the concept of the Watcher in Eckhart Tolle’s book, “The Power of Now,” which I HIGHLY recommend for anyone interested in this topic. Myers-Briggs is a perfect place to gather insights to begin the process of mindfulness about oneself. Thanks again for taking the time to comment, Alison. Myers-Briggs is one of my favorite topics! SCCO’s faculty is truly a gem as no other school has invested so much in helping us students who are optometry school hopefuls. This definitely gives me reassurance that if SCCO is so willing to help students who are applying to optometry school, than SCCO students have nothing to fear with such an involved and caring faculty. I am ENFJ, which I believe is also your personality type! I am a “Persuader” which is described as an “outstanding leader of groups. Can be aggressive at helping others to be the best that they can be.”When I first read my result I was surprised but after letting it stew I realize never in my life have I read a more truthful personality result, especially concerning the bit about being “aggressive at helping others to be the best that they can be” as it is something I definitely exhibit with friends, family, peers and the kids I mentor. Thank you for all the help and the fun personality quiz! So nice to hear from you and thank you SO MUCH for such kind words! We are about helping students. Thank you for recognizing and acknowledging this aspect of our program. You are our future colleagues, so why wouldn’t we want you to be the best optometrist you can be, joining our ranks and representing the profession. A fellow ENFJ! Oprah Winfrey and Abraham Lincoln are/were ENJFs. There is no personality who loves, who believes in the goodness of people, more than the ENFJ. We are persuasive, as you have pointed out. In fact, we can’t even believe why anyone wouldn’t want to help us “lead the charge” for every purpose we believe in. I can’t tell if that’s a fault in our temperament or not, but I KNOW I feel that way about getting into optometry school. You bring up a wonderful point: you didn’t REALIZE your ENFJ inside. How could you without a test like the MBTI to itemize it, to articulate it for you. Now you can recognize the potential in your ENFJ: to be a champion for patients, even the profession. We ENFJs will work tirelessly to believe in and execute a cause. We are idealists to the max (and sometimes to our detriment because we run the risk of being too idealistic, too “Pollyanna-ish” about a cause or a person–I’d hyperlink the Wikipedia article to this term but I can’t do this in the comments section). Only 25% of the population are “N,” or “intuitive.” Couple that with your “F,” your feeler, and your broader MBTI category is an NF (intuitive feeler). I cherish the NFs in my life. We’re not much for critical analysis or strategic planning, but we inspire people to follow their dreams and never give up! We believe in the big picture! What better company could we be in than Abraham Lincoln. I’m so happy to know that about you Gail. Thanks for taking the time to comment. I LOVE this stuff! I concur with the previous post regarding the friendliness of SCCO staff! Based on my interactions, Eryn goes above and beyond to help applicants navigate the admissions process. Also, thank you very much for your insights from the article! MBTI accurately pegs me as ISFJ (The Guardian/Protector – loyalty and compassion being the attributes that fuel me). My wife (ESTJ) and I were recently assessed (reassessed, in fact) as part of a marriage preparation sessions through our church. It was fun and enlightening expanding our knowledge of each other in this way! Without question, we were better prepared because of it! Looking forward to more interaction with SCCO in the near future! Thank you again, Dr. Munroe! Thank you for the kind words of praise regarding the admissions staff here at SCCO. Eryn and I both feel a strong commitment to helping applicants. I am SO happy that this article has taken off the way it has and that it resonates with applicants. I am a great believer in its philosophy and am so pleased that applicants recognize the wisdom in this practice of “mining your own treasure” inside yourself! And of course, an ISFJ like yourself would appreciate this reasoning—anyone with a “F” can relate. I am an ESFJ (Extroverted, Sensing, Feeling, Judging)! Surprisingly, this result was pretty much spot-on to my old personality tests I took back in high school (Yes…I went digging for them after taking this MBTI again haha). My ability to look on the “bright side” of both people and situations is something I have prided myself on through the years and I was happy to see that confirmed in my portrait. Now I definitely understand why a career in Optometry seemed like the perfect profession for me! I derive so much of my own pleasure from the happiness of others that any other profession that did not directly help others seemed dull and uninteresting to me. Thanks for the tip, Dr. Monroe! This definitely helps me put my own personal belief system into words a little bit better! Thanks for participating. I’m waiting at the airport to go speak at UC Berkeley. I think I’m going to talk to the pre-optometry group and recommend they take the MBTI for reasons you mentioned: to find out what it is in your personal hardwiring that shapes your choice of career and how you wish to serve. ESFJs and ENFJs make wonderfully compassionate healthcare providers because they are genuinely energized by interactions with people. As such, you will love optometry. Also, the J in you likes routine and production. Optometry has plenty of that. Thanks for posting your reply. I hope more applicants use this to recognize and describe in tangible ways what they personally will bring to the profession. I am an ESTJ, or “administrator.” I love working in an active environment where I have a chance to interact with people throughout the day. I am incredibly honest and straight forward with others (no sugar-coating from me) but it is because I like to be realistic about what is in front of me. I prefer to work concrete facts rather than the abstract, which aids my ability to make tough and important decisions. Thank you so much for recommending we look into our own MBTI personality types. I’ve found out this summer it can be a little hard talking about myself, as I can be incredibly self-critical sometimes, but this definitely helps and I can see now I can focus my strengths and use them to contribute to the optometric community. Ah-ha, the “administrator!” You are the one who can juggle lots of balls and not get rattled! I would advise you to consider your MBTI profile as you find mentors in perhaps optometry school faculty because you may want to consider a career in administration at some level–either in private or group practice or even optometric academe. Your weakness will be finding a true connection with patients who relate as feelers (i.e., those who need lots of hand holding). Your tendency will be to appeal to their logic when they have none. You are SO right about identifying your weaknesses. Every MBTI profile has theirs. The goal in behavior is to apply whatever trait the situation calls for. For you, when a situation requires logic and introspection, you’re all over it. When it requires spontaneity, emotion, abandon, and empathy, you’ll have to be more mindful and intentional because those traits don’t come easy to the ISTJ. I am almost the exact opposite of you: when necessary, I have to work VERY hard to be analytical, factual, literal, and linear in my thinking. Instead of being harsh with myself, I instead remind myself that these are traits I don’t intrinsically possess. I then say to myself, “What would an INTJ do?” Yep, that’s what I do…! Your closing paragraph’s comment about how it is difficult to talk about yourself is why I recommend this method. Now you have something to talk about in concrete terms. For your personal statement, I would recommend making the most of the doctor-like qualities—in your case, your rational thinking and decision-making skills—to feature about yourself. If talking about your strengths and weaknesses is a topic that comes up in the interview, you can discuss with objectivity both your strengths and weaknesses. Remember, weaknesses are ONLY weaknesses if one is blind to them, if they are biases. Once you can “call yourself out” for aspects of your temperament/traits that needs work, then are no longer weaknesses. Whether it be in your personal statements or the interview, I cannot express to you the maturity you will convey when speaking about yourself in these real ways. Hi Dr. Monroe- I always like to read and learn more about personality tests. Thanks for the insight on MBTI and how to use it to bring out my personal characteristics to help me improve my optometry application (as well as attain pertinent life skills)! Thanks for always posting helpful information to peruse through! Thanks for taking the test and posting your results. You’ve really taken the exercise to heart! I will post the link you shared, which addresses specifically what job is best for what MBTI temperament. I didn’t want to get too detailed in my post, but you brought up one of my favorite aspects of Myers-Briggs: rather than trying to remember 16 profiles types, there are only really 4 basic categories (http://personalitycafe.com/keirsey-temperament-forums/). This distillation came to us via the work of David Keirsey, of the book I recommended at the end of the post. Those four basic types are NF, NT, SJ, and SP. That’s the system I use when I am sizing up others. I like that your forum link talks about MBTI in that shorthand, which makes it more accessible for beginners. Yes, an SJ that is extroverted would be a great doctor. You are a guardian, someone who watches over others. You would be that doctor who feels a tremendous obligation to care for, be responsible, to your patients. I wish I had more T personality traits (objectivity and analytical thinking), but alas! You have found out TERRIFIC stuff here to talk about yourself in both your personal essays and your interview. You cannot imagine what maturity you will project when you explain that you took the time to understand yourself better—especially true for a young person who suffers with “You Don’t Know What You Don’t Know” a little more than us older, wiser ones. You’ve taken the time to find out a little bit more of “what you don’t know.” Way to go! It is so nice to hear that someone is cheering us on! I do agree with you, the process does cause a lot of uncertainty. I am grateful for your help, and your kind words! It makes the process less intimidating, as I am preparing my application for SCCO I have warm feelings of excitement and endearment for the program. I’m looking forward to visiting the campus at some point! I think you are a great example for someone who loves this profession, it shows by how enthusiastic you are with helping applicants. Thank you again and I look forward to hopefully meeting you and the faculty! I don’t know what to say! Thank you for taking the time to express your thoughts. An applicants is often surprised to learn that we consider you to be a valuable resource. Without your hard work, preparing yourself to take on the mantle of being an optometric physician, our program would not exist. It’s the renewing hope from the next generation of optometrists-in-the-making such as you who keep it all going! I am privileged to help you in any way I can. I have the utmost respect and admiration for all of you who are working so hard. I’ll look forward to receiving your application. Your preparation will no doubt help you enjoy every step of this process. I’m an ESFJ, which has the title of “The Caregiver”! I feel like it is spot on, as I worked as a caregiver for a year and many of the qualities in the description ring true with me. “ESFJs at their best are warm, sympathetic, helpful, cooperative, tactful, down-to-earth, practical, thorough, consistent, organized, enthusiastic, and energetic. They enjoy tradition and security, and will seek stable lives that are rich in contact with friends and family.” Thank you for this article Dr. Munroe! This is very helpful! Thanks Julie for your comment. Eryn Kraning, the Assistant Director of Admissions, is also an ESFJ. My best girlfriends are ESFJ’s because they take all my “imagining” from my intuitive “N” and help me actualize it. Thanks for posting! Hey Julie…I’ll relay your kind words to Eryn, and I thank you personally for your kind words of praise. Applying to optometry school is inherently filled with anxiety and doubt. What’s worse is that applicants are going through this process almost in a vacuum, with sometimes even their families not understanding the intimidating nature of the process. That’s why I want to help! I often get asked: if I you enjoyed practicing optometry (and I did for 30 years) so much, why are you now working with pre-optometry students instead? The answer is that YOU all, everyone of you, are now my “patients.” You are the ones who need my advice and steering. It’s quite a blessing to me to help all you bright, motivated, caring students who are investing well-spent time in your future—a worthy endeavor! While you go through all your planning and delayed gratification, I’m here to help and to cheer you on! I hope I am an example of someone who loves this profession as much as any optometrist! Optometry has given me a lifelong community membership that has been intellectually stimulating, and most of all, a way to serve others. If you think I am welcoming you into the SCCO family, just wait until you meet our faculty! I’m happy to be their promissory note! Thanks for taking the test. Of course, an ESFJ would respond and write such a heartfelt message. I appreciate the time you took—means a lot, more than you know!